YEREVAN, April 23. /TASS/. Speaker of the Armenian parliament, Ara Babloyan, met with the arrested opposition lawmakers overnight to Monday who were the organizers of mass protests in Yerevan, the parliament’s press service reported. "Ara Babloyan met with Nikol Pashinyan, Ararat Mirzoyan and Sasun Mikaelyan not as the head of the parliament but as a person and a doctor. He does hope that his request, that is, to resume real dialogue with the country’s prime minister, will be worth something," the press service noted. Armenian President Armen Sarkissian, Prime Minister Serzh Sargsyan, many parties and political organizations earlier urged opposition members to maintain political dialogue. On Sunday morning, Armenian Prime Minister Serzh Sargsyan and opposition leader Nikol Pashinyan met in Yerevan’s Marriott Hotel. The latter demanded the resignation of the head of government. Sargsyan said in response that attempts to blackmail the country’s legitimate authorities are unacceptable. After that the negotiations stopped. 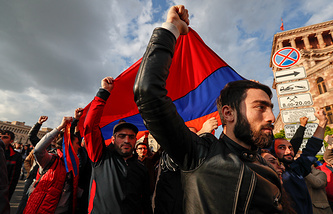 The Armenian Prosecutor General’s Office confirmed on Sunday, April 22, that law enforcement officers had hauled off opposition lawmakers Nikol Pashinyan, Ararat Mirzoyan and Sasun Mikaelyan for holding illegal rallies.